It's official; Moose Jaw Police Chief Rick Bourassa will be sticking around. The well respected local chief renewed his contract with the City, agreeing to stay on for an additional five more years. 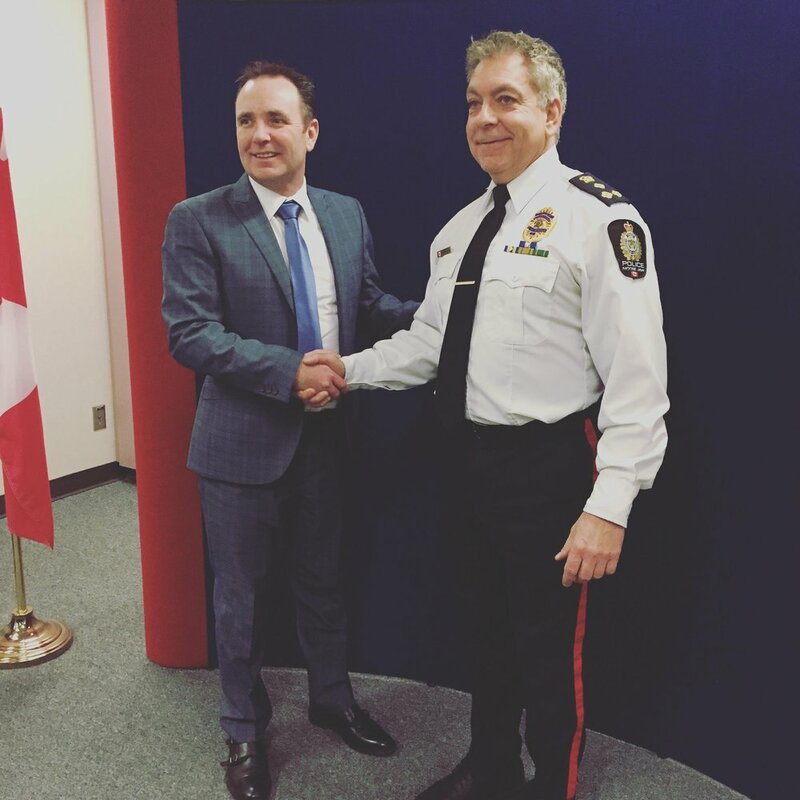 During a conference at the Moose Jaw Police Station, Mayor Fraser Tolmie introduced the Police Chief while praising the work he has done for the city in the past. "Normally," Tolmie said, "when I stand before you, we are welcoming new officers in...now we are glad to announce that the board has unanimously decided to renew his contract with the city". Tolmie addressed Bourassa directly; "we are looking forward to another five years of your leadership." Bourassa gave a brief speech in which he expressed "I've laid out a vision to keep Moose Jaw a harmonious city. We are becoming more diverse, we are moving forward technologically". He went on to thank all his fellows police service workers for their hard work and for being helpful with and going along with his vision. "It's a privilege to be apart of this organization," he said. "We are everybody's police; it's important to be a part of the city." During a media scrum, Bourassa fielded questions about moving forward, to which he claimed it was "important to be more diverse", and he promoted "inclusive hiring". On the recent rash of drug busts and methamphetamine activity in the city he said "when we have illegal drug activity, we focus on the groups that might be involved. This activity isn't contained to a particular city." He claimed that other cities are dealing with similar drug-related problems. He claims they are hard at work getting to the bottom of and finding resolve for the drug problem. "We have enhanced investigative capabilities". Asked about the law enforcement difficulties and expenses that come with the legalization of marijuana, he said "there are so many unknowns that we can't be completely accurate. There will be coats attached with regards to impaired driving." Due to confidentiality, he couldn't give certain details, but he did acknowledge that he will be working with the Province to figure out all the cannabis-related expenses.